New supplied air regulator Airkube® for Navitek® ! Powered-air Navitek® helmets are now available in supplied air version, thanks to the new Airkube® regulator approved according to EN14594 certification and the new EU regulation 2016/425. Airkube ® allows to regulate 3 to 8 bars pressure from the breathable supplied air network in order to provide adjustable airflow from 190l/m to 280l/m in the headtop. A sound alarm warns the operator in case of drop pressure. Perfect for welding, grinding and cutting in confined environment and/or fixed positions, Airkube ® offers a technical, easy to use and low-maintenance solution. 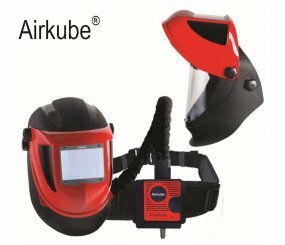 Airkube ® is available with powered-air Navitek ® S13 with colors and contrasts restitution, Navitek® S4, Navitek® Clear Visor, and Navitek ® DIN 5 Visor.